Our 50th anniversary is a significant milestone in our history and development as a Private Limited Company. It provides us with an opportunity to reflect on our rich past, and look forward to an exciting future. Harringtons Builders PLC is a leading national construction company successfully delivering projects across the UK. Our 50-year track record of success is demonstrated in the landmarks we have helped create. We have a team of specialists capable of maximising the result and delivering the projects. You can be 100% sure that your project will be delivered right on time, within the set budget limits. 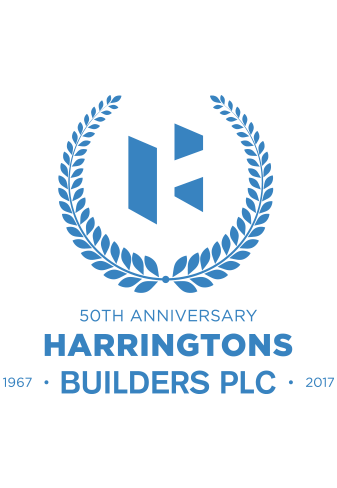 Mr C F Harrington established Harringtons Builders PLC in 1966, and the company registered as a Private Limited Company in November 1967. The company name changed to Harringtons Builders PLC in April 2001. Our 50-year track record of success is demonstrated in the landmarks we have helped create, delivered by a skilled workforce, best-practice safety and management systems, and our common sense approach to achieving excellent project outcomes. Harringtons Builders PLC has developed a depth of experience and expertise, building on its reputation, which is unrivalled amongst its competitors making the Company one of the leading contractors in its civil engineering and groundwork operations. Our ability to successfully deliver large, complex projects has received industry accolades for professional excellence and earned us a reputation. Importantly, it shows our technical capabilities and high standards of safety, quality and environmental management. Operating from self-built purpose designed offices, plant depot, and workshop in Wembley, Middlesex, Harringtons Builders Plc continues to increase its market share and remains dedicated to fulfilling the Company’s objectives of providing Clients with a comprehensive range of specialist services covering all aspects of ground engineering operations. Innovativeness is the pledge of our stable development. We tap into the most successful international management data, forestalling the market & setting new standards. High quality standards at all of Harringtons Builders PLC projects. We have continuous control mechanism including monitorisation of works at all stages of construction to achieve Today's high reputation. We are a valued partner of those we work with, carrying out both long term building partnerships and individual projects with a collaborative team approach that harnesses the strengths of all involved. We take certification very serious. We schedule routine trainings for employees including Health and Safety training and certification is very important for us. Harringtons Builders PLC has developed a depth of experience and expertise, making the Company one of the leading contractors in civil engineering, groundworks and RC Frames. You can be 100% sure that your project will be delivered right on time, within the set budget limits. All aspects of the operations being transparent and clear for clients and partners.